Copyright 2002 by James E. Lancaster, Ph.D. 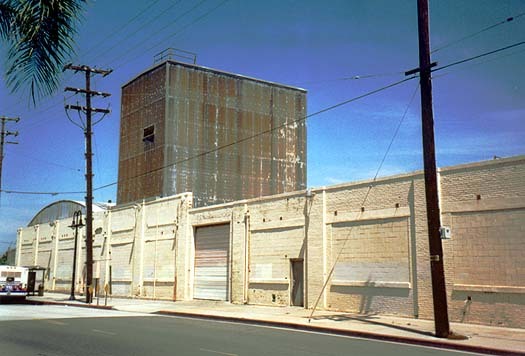 There are several former former packing houses and other interesting structures in Orange, CA. Most are along the former Santa Fe main line that is now the Metrolink/BNSF main (Map). Since the widening of I-5 through Anaheim and Santa Ana, UP (ex-SP) also uses these tracks to get from Anaheim to Santa Ana. 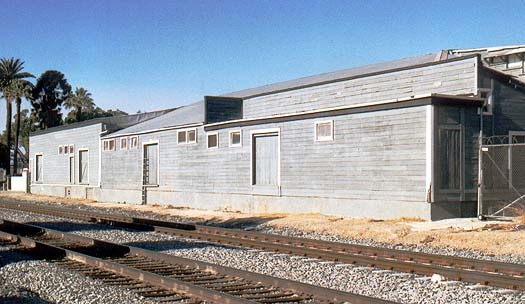 The sidings that served these structures have been removed. 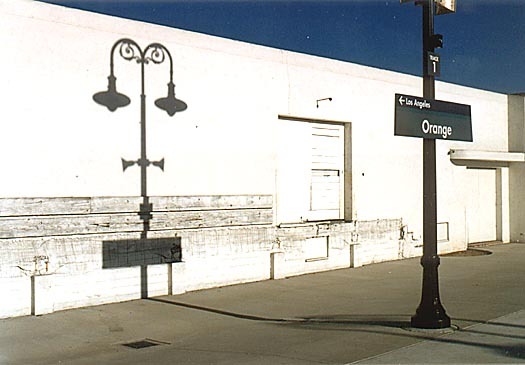 Unless otherwise indicated, the following photos from Orange were taken in 1999, 2001 and early 2002. Our virtual tour of Orange begins at the south end of the industrial district. 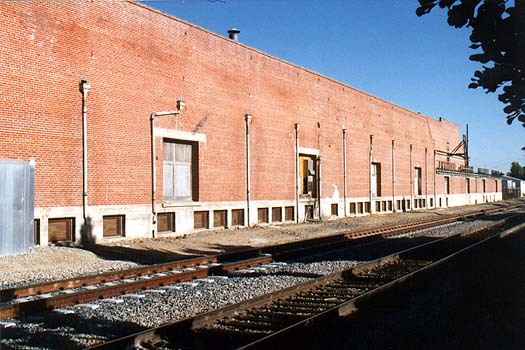 The first photo shows the northwest corner of a brick packing house on the south side of West Almond Avenue where it crosses the ex-ATSF tracks (location 1 on Map). From the late 1920s through at least the early '40s it was the Orange Mutual Citrus Association. Sometime after that it became the Orange Cooperative Citrus Association. The building now belongs to St. Vincent de Paul. 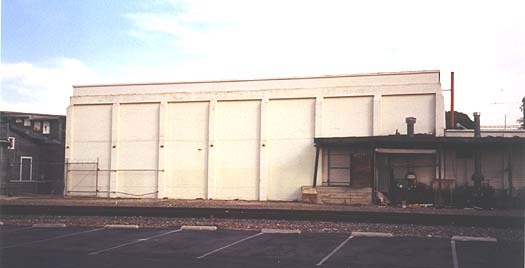 The next photo shows the side of the building next to the tracks. 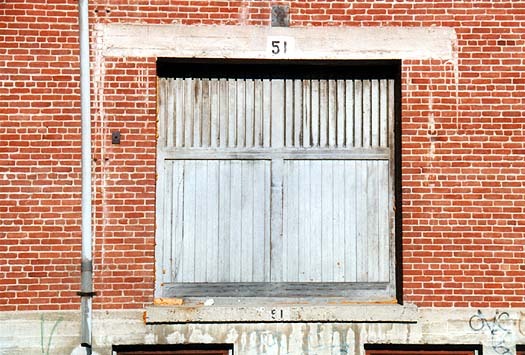 (Photo-JL) followed by a close-up photo of trackside loading door number 51 (Photo-JL). The front of the building was stucco (Photo-JL). Next door on the east side was a smaller building that was also part of the complex and appears to have been an office (Photo-JL). The next photo is a view looking north-northeast from Palmyra Avenue and shows the Orange Cooperative packing house from the south (Photo-JL). A newspaper article from April 1931 told how the Orange Mutual Citrus Association had begun construction of a 158' by 85' pre-cooling plant at a cost of $80,000. It was to have twelve rooms, each capable of pre-cooling five carloads of fruit. 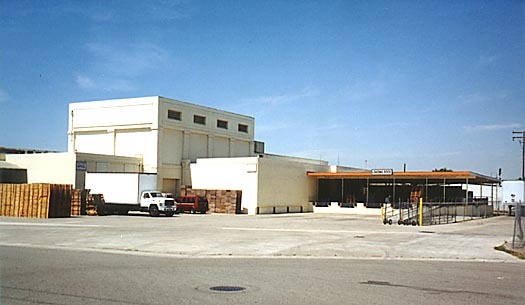 The nearest four loading doors appear to be part of the pre-cooling structure. The doors are 50' apart. The pre-cooling plant is the higher brick building in this view (Photo-JL). Here is a close-up view of the pre-cooling plant. It is clear from the photo that there was an icing platform directly above the four nearest loading doors that are 50' apart. The openings in the railing along the edge of the ice deck are wide enough to load ice into either a 40' or 50' car. 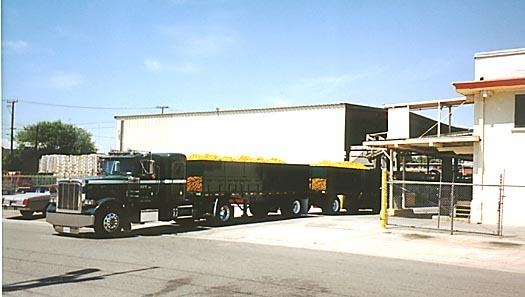 Thus this packing house could load reefers with pre-cooled fruit and ice the reefers at the same time (Photo-JL). 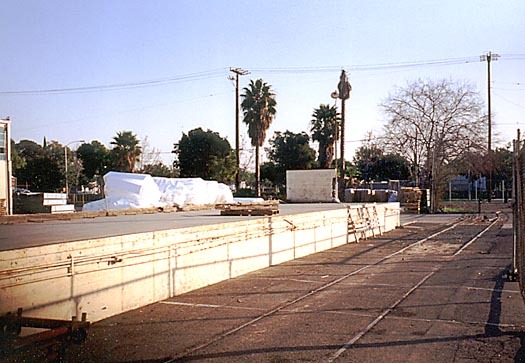 As of January 19, 2002 the wall had been painted and the name was no longer visible. Now we move north about one and one-half blocks. 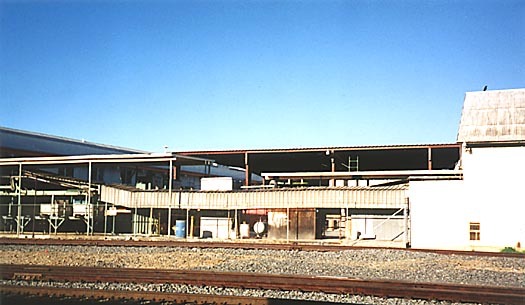 In a view looking northeast, the next photo shows a wood packing house on the east side of the tracks just south of Chapman Avenue (location 2 on Map). Until 1929 this was the Red Fox Orchards packing house. In that year Red Fox merged with McPherson Heights to create the Consolidated Orange Growers Association. The building is now occupied by RBW Party Props. 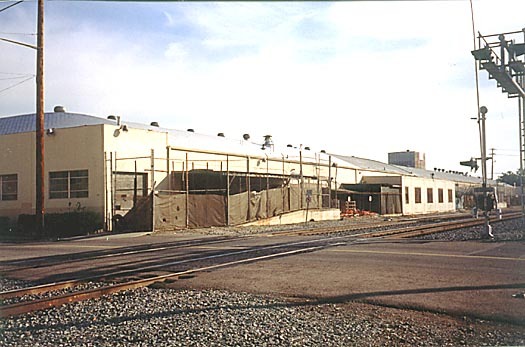 Just south of the Consolidated Orange Growers shed, and part of the complex, was a concrete pre-cooling and cold storage structure (Photo-JL). Here's a side view (Photo-JL) and a close-up view from early 2002 showing what appears to be some long-out-of-use boilers (Photo-JL). In an earlier photo the boilers were hidden behind some corrugated sheet metal (Photo-JL). This view is looking south-southeast from Chapman Avenue. 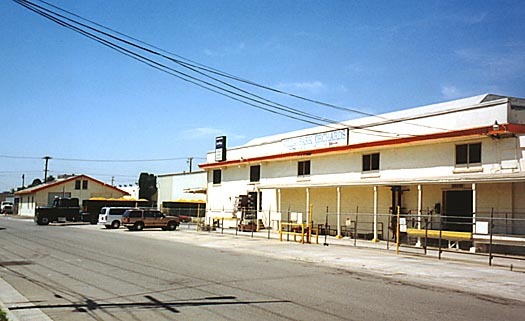 The Consolidated Orange Growers packing house is on the left (gray wood building). Beyond it is the pre-cooling and cold storage structure (white concrete building). In the distance is the Orange Cooperative packing house (brick building) (Photo-JL). 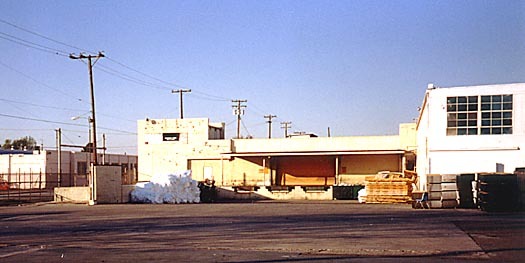 The Blue Goose packing house once stood on the west side of the tracks, just out of view on the right. 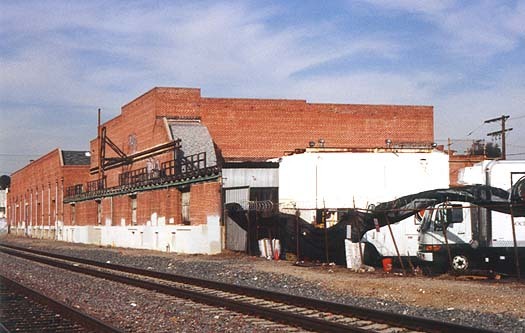 The photo location is less than a block south of the former ATSF Orange depot (location 7 on Map) (Photo-JL), now a Metrolink stop (Photo-JL). 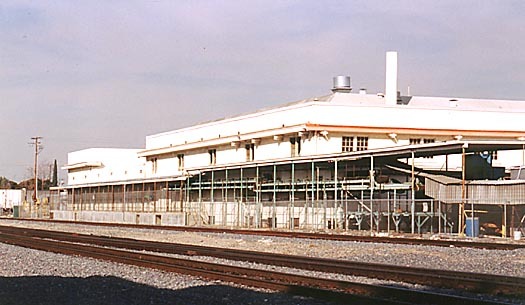 At one time the Rosenberg Brothers Company walnut and dried fruit packing house stood on the west side of the tracks opposite the depot. The area is now a commuter parking lot. 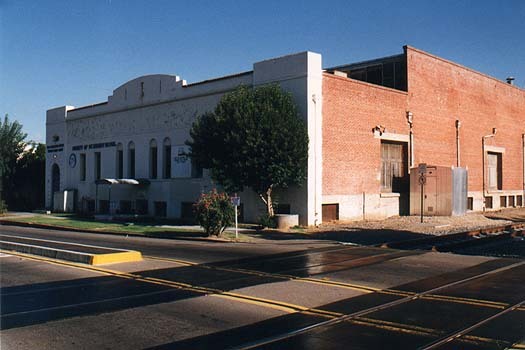 A large Anaconda Wire and Cable complex of buildings was just north of the Santa Fe depot. 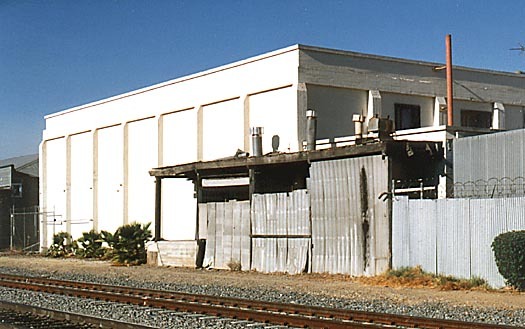 It eventually occupied the entire block between Cypress Street on the east and the Santa Fe tracks on the west and between Maple Avenue on the south and Palm Avenue on the north. It also occupied buildings on the east side of Cypress. This photo shows the south side of the building complex (location 3 on Map) (Photo-JL). Note the large tower that appears to be a cooling tower. The next view is looking across Palm Avenue at the northwest corner of the building complex (location 4 on Map) (Photo-JL). The cooling tower is visible at the far end. 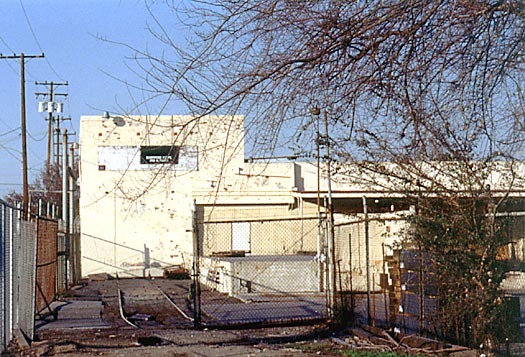 At one time this corner was occupied by the Diamond Walnut Growers packing house (also known as the Richland Walnut packing house). 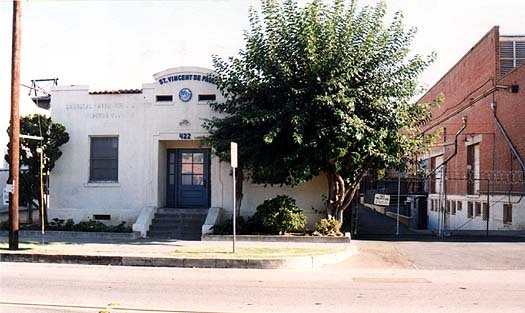 North of Palm Avenue was a packing house and several other buildings belonging to the Santiago Orange Growers Association (location 5 on Map). 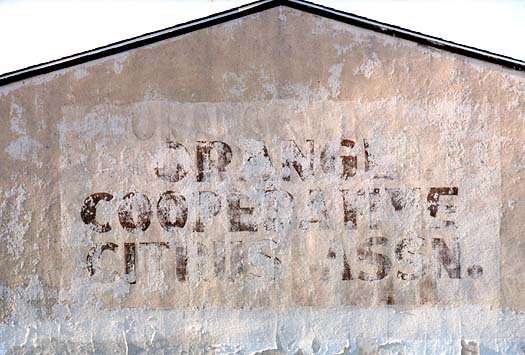 Organized in 1893, the Santiago Orange Growers Association was one of the earliest co-operative packing houses. The packing house was built over a period of time beginning around WW I and at its peak the facility packed over 800,000 boxes of oranges each season - reportedly more than any other packing house in California. Today, the facility - with its old equipment intact - is operated by the Villa Park Orchards Association. Though it bears the name of a neighboring city, the Villa Park Orchards Association has been located in Orange for more than 30 years. 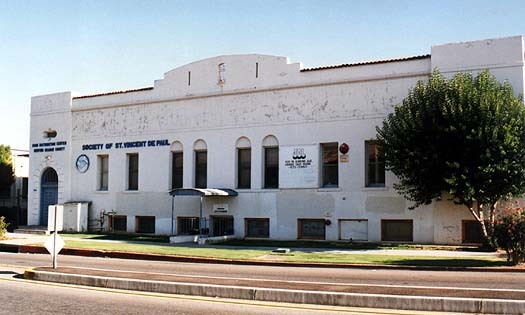 The association was established in Villa Park in 1912 and incorporated in 1913 but by 1981 the Villa Park packing house had been vacated and sold and all operations were concentrated at the Orange location. 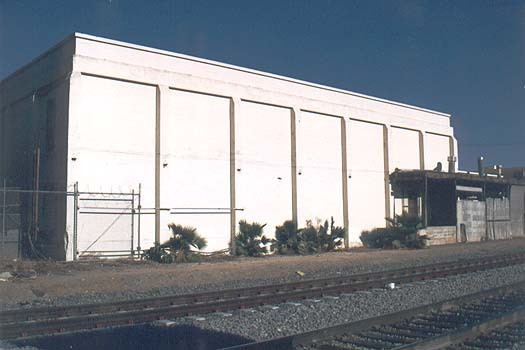 The Santiago Orange Growers Association packing house was served by the Santa Fe on the west side and the Pacific Electric on the east side. 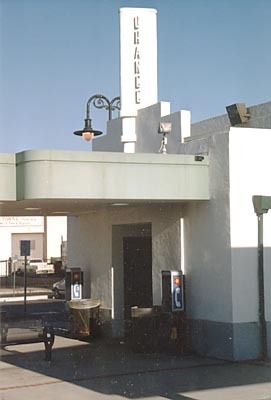 The PE line was an isolated branch that ran from the SP's Tustin Branch on the north side of Orange south to Chapman Avenue. 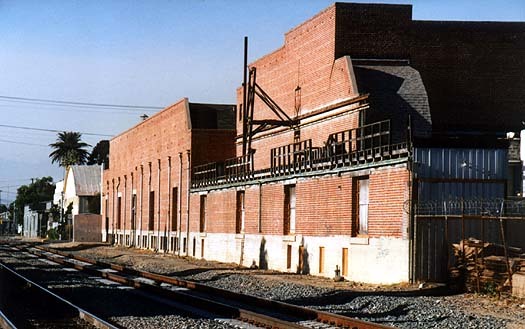 At the north end it was adjacent to the Santa Fe's Olive subdivision tracks but north of the Santiago packing house it made an S-turn to the east, cutting across the northeast corner of the packing house property, then running down Cypress Street. 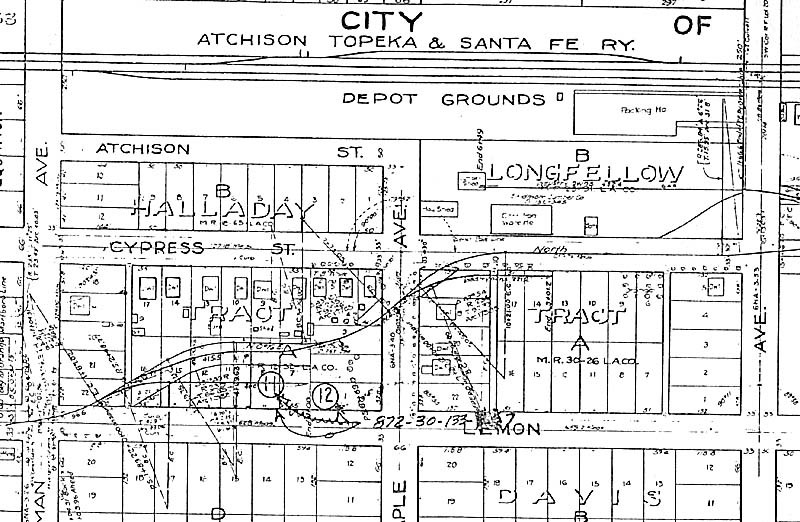 The Santa Fe and PE tracks are shown on this (Map) of the area along Cypress Street from Walnut Avenue on the north (right on the map) to Palm Avenue on the south (left on the map). 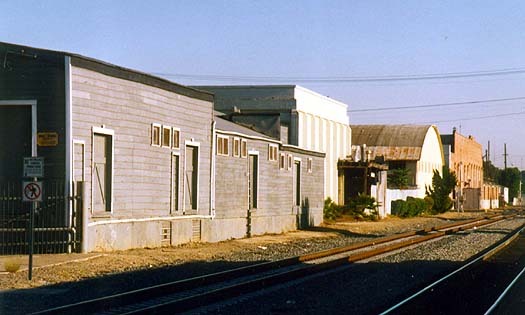 The Santa Fe tracks are at the top (west) and the PE tracks make an S-curve near the center to reach the east side of the Santiago packing house. The latter eventually swing into the center of Cypress Street where it crosses Palm Avenue (left center on map). Our virtual walkaround of the Santiago/Villa Park complex starts at the southwest corner of the property where the ex-Santa Fe tracks cross Palm Avenue. 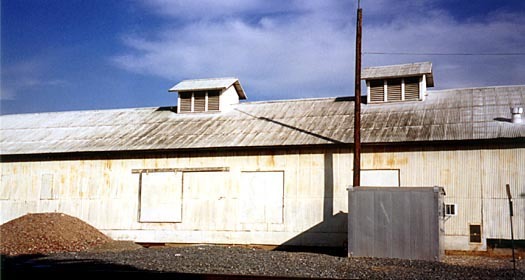 The first photo shows a corrugated metal building that was at one time used for storing fertilizer (Photo-JL). 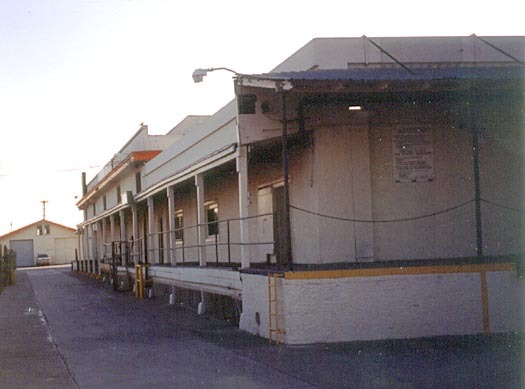 The next two photos show some of the citrus processing equipment (Photo-JL) and the loading dock on the Santa Fe side (Photo-JL). 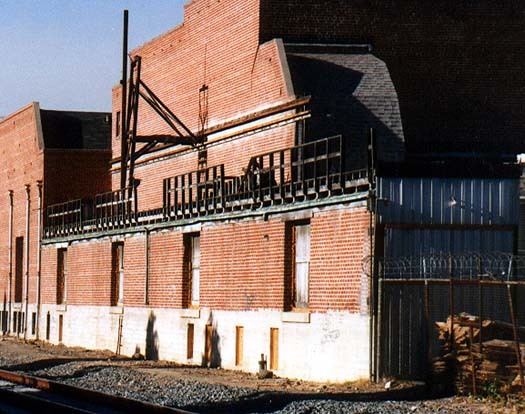 The next view is from Cypress Street looking at the northeast corner of the packing house and showing a truck loading dock and a pre-cooling structure (Photo-JL). Before they were removed the PE tracks cut diagonally through the foreground area. Further south along Cypress Street we see the front of the packing house. Finally, we see the loading dock on the PE side (Photo-JL) followed by a close-up of the Villa Park Orchards sign (Photo-JL). 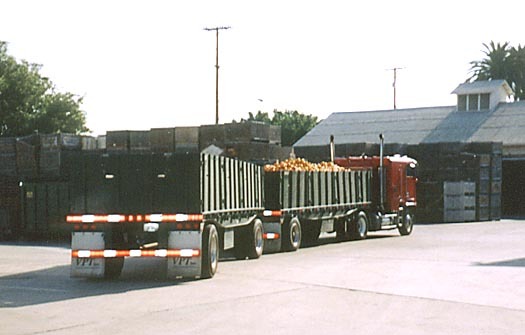 Villa Park Orchards is still processing truck loads of oranges as evidenced by these photos from June 2001 (Photo-JL) and May 2002 (Photo-JL). 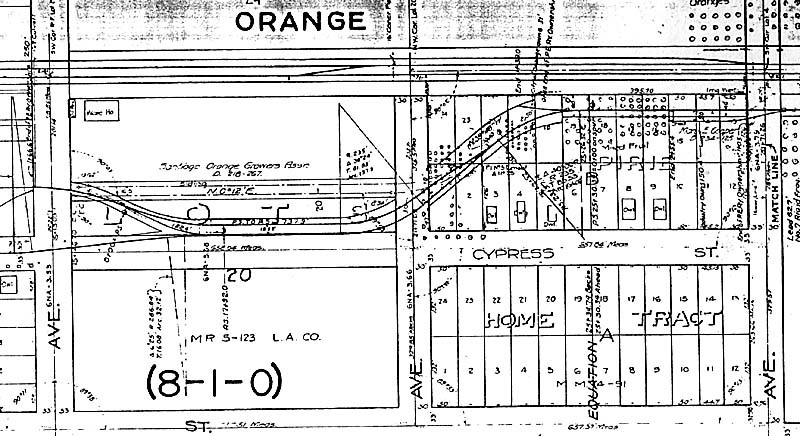 As shown on a second map (Map), the PE tracks came down the center of Cypress Street south of Palm Avenue (right side of map) before making another S-curve near Maple Avenue to enter a small yard (runaround track and siding) between Maple and Chapman Avenue (left side of map). 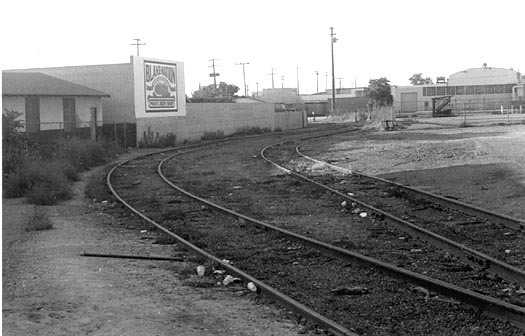 A PE depot was located at Chapman Avenue and at one time a PE streetcar line that ran to Santa Ana extended south of Chapman on Lemon Street. This photo looks north along Cypress Street from Maple Avenue (Photo-JL). At one time the PE tracks came down the center of this street before cutting across the property at the right (Photo-JL). On the last Sanborn map this corner was listed as the Barr Lumber Company. 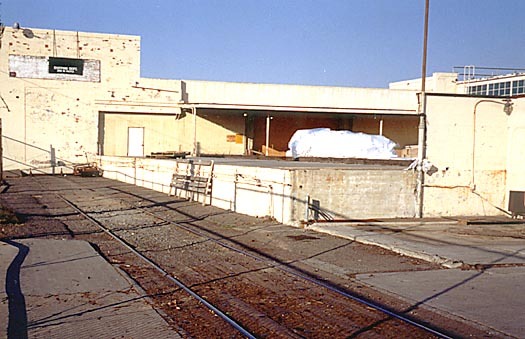 A loading dock on this property still has the rails of a PE siding, as shown in these photos looking northeast (Photo-JL), southeast (Photo-JL), and north from the corner of Cypress and Maple (Photo-JL). Most of the PE tracks were gone by the mid-1980s. 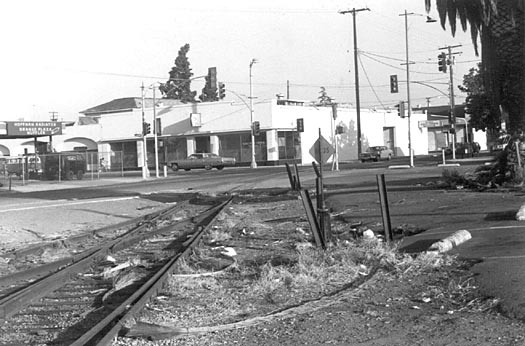 However, before the small yard between Maple and Chapman was removed, Clifford Prather photographed the tracks looking north toward the former Barr Lumber Company location (Photo-CP), and south toward Chapman Avenue, where the tail track of the yard extended into the street (Photo-CP). The date of these two photos was July 1982. Clifford Prather photos, used by permission.